The 2019 Honda Pilot has several exciting new features and updates that have been made for the model year. As the newest installment of the Pilot's third generation (which emerged in 2016), the 2019 lineup has all the things drivers love about the previous year's model plus a 9-speed automatic transmission that has exponentially smoother shifting than what you get on the 2018. Also, there are plenty of new technological features, which includes an updated infotainment system that is even more user-friendly. 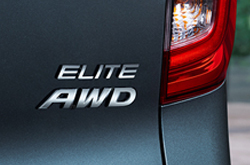 Honda additionally made the advanced safety features found in the Honda Sensing suite standard on every trim level. To top it all off, there were several minor changes made to the vehicle's styling to make it look and feel even more contemporary. 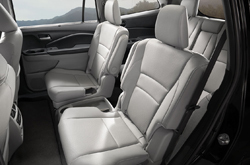 What Major Trims and Features are in the 2019 Honda Pilot? The 2019 Honda Pilot comes in your pick of five different trim levels. The base trim is known as the LX, and it comes standard with 18 inch alloy wheels, a rear view multi-angle camera, a 6-speed automatic transmission, lane keep assist, and adaptive cruise control. The next trim up is the EX, which includes an 8-inch touchscreen display, Cabin Control and Hondalink, Apple CarPlay and Android Auto, a blind-spot monitor with rear cross-traffic alert, and LED fog lights. The EX-L adds a power liftgate to the rear, a power sunroof, an auto-dimming rear view mirror, and USB charging ports for second-row passengers. The EX-L's sub-trim adds an intercom system to the rear that can be accessed through headsets and a 10.2-inch screen as part of the rear seat entertainment system. The Touring trim has everything you find on the EX-L sub-trim and below but also features roof rails, parking sensors for the front, and 20-inch wheels. At the top of the line, the Elite trim features standard captain's chairs, a heated steering wheel, and a wireless charging pad. Each trim level on the 2019 Honda Pilot comes with a standard 3.5-L V6 engine that is capable of producing 280 hp and 262 lb-ft of torque. The powertrain is rounded out with a 6-speed automatic transmission on the base LX trim or a 9-speed automatic transmission on the higher trim levels. While this is an ample amount of power, you will have to press a little harder on the gas to get a swift acceleration speed. However, it is entirely possible to go from 0 to 60 mph in just 6.9 seconds on the Pilot, making it one of the more athletic SUVs in its class. 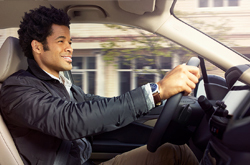 Honda is known for valuing the safety of its vehicles, and the 2019 Honda Pilot is no exception to this rule. As far as safety features go, you get a host of advanced safety features (like adaptive cruise control and road departure mitigation) with Honda Sensing regardless of which trim you buy. The blind-spot monitoring system will alert you if another driver is riding too close or in your vehicle's blind-spots. As far as ratings go, the National Highway Transportation Safety Administration (NHTSA) has given the 2019 Honda Pilot an overall 5-star rating**. It is clear to see why this is a vehicle worthy of your consideration.